Imagine walking through the yard. It's calm, peaceful, the birds are singing, the sun is shining. Moles are a common spring and summer menace. They dig extensive tunnels and can eat many of the insects in a yard, leaving gardens barren and destroyed. A quick search on the internet suggests that mothballs can get rid of moles. But does this actually work? How to Use Mothballs Against Moles? Can You Get Rid of Moles with Mothballs? Many people consider moles unusual creatures. These mammals spend the majority of their time underground, excavating massive tunnel systems to live and search for food. A common misconception is that they are blind, but they can actually see. Moles can be found on every continent except South America and Antarctica. They tend to be hairless and have medium-sized snouts used to find food. There are seven separate species in the United States, but most people will encounter the famous eastern mole. What Is an Eastern Mole? The eastern mole is a small, gray mammal which lives throughout the eastern seaboard, Midwest, and parts of the central United States. It's typical diet includes worms, grubs, insects, and sometimes vegetation. Normally, they will not eat plants from a human garden but can wreak havoc by tunneling under the roots and causing collapse. Why Are Moles a Problem? If moles don't eat gardens, then why are they a problem? Well, as mentioned earlier, they like to tunnel. Their intricate systems can destroy the roots of flowers and vegetables or can ruin the foundation of yard buildings like a garden shed. Another problem is that they eat beneficial bugs like earthworms. Gardeners like earthworms because they eat decaying material and produce fertile soil, can improve the earth's drainage, and help keep dirt shifting and moving so plants receive nutrients. Without them, flowers might struggle to grow. Since moles eat these bugs, they can throw the natural balance of a garden out of whack. Mothballs sound harmless but are actually a form of solidified pesticide. People used to put them in closets and wardrobes to drive away moths, which would eat the fabrics. Over time, the solid mothball would decay, releasing the pesticide as a gas which people might accidentally inhale. The most common ingredients are naphthalene or paradichlorobenzene. In theory, the practice of using mothballs against moles is simple. All a person needs to do is buy the solidified pesticide, locate a mole tunnel, and then pour the mothballs inside. Over time, the mothballs will break down, releasing their pesticide, which the moles will inhale. In short, no. The pesticides contained within mothballs are not as harmful to moles as they are to moths. At best... a mothball could work as a decent mole repellent but it will not completely remove your mole problem. What's most likely going to occur when you start spreading mothballs around your yard is that your mole is going to build a different tunnel and/or route. Instead... we recommend other methods of removal. Traps (Lethal): Devices that are placed in mole tunnels to catch the rodent. Poisonous Bait (Lethal): Chemical bait that mimics the food moles eat resulting in a dead rodent. Repellent (Non-Lethal): Chemicals and vibrating stakes in ground to deter moles from tunneling in your yard. 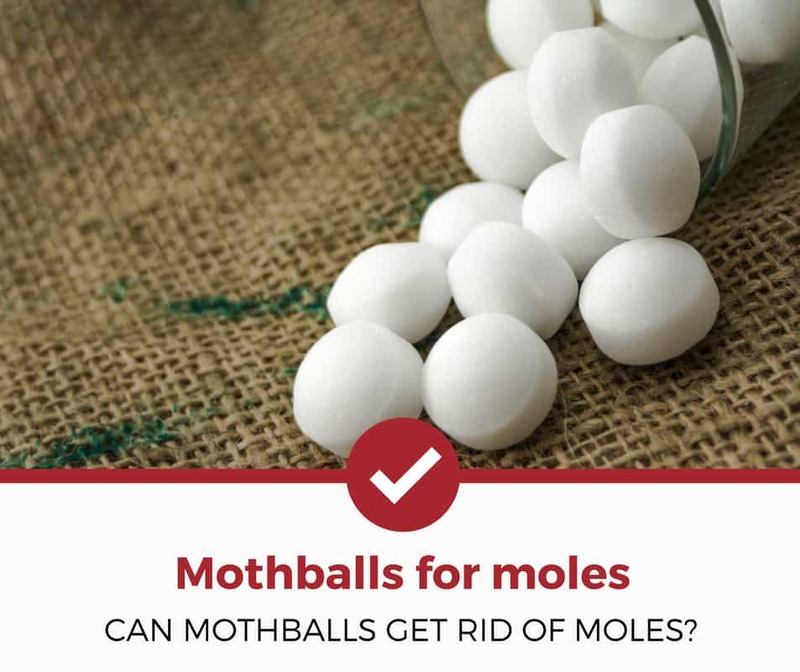 Mothballs aren't the best mole remover, but there are still many ways to get these pesky pests out of the yard safely and effectively. Questions? Feel free to leave a comment down below. Curious about other mole related articles? Check out our other detailed guides to help you deal with your pest problems.